That is sometimes our response when someone asks us for help or advice. When we see someone struggling in an area of life that may be familiar to us, we sometimes distance ourselves, don’t want to get involved, don’t want to engage the person. The cause behind this could be humility, or more directly stated, false humility. I have personally experienced this. I have had people ask me to share some wisdom and I have refused. I acted as though I had nothing to speak into their situation. It may have been because I thought I was too busy or I just didn’t want to take the time. But I admit, there were times that it was because I was playing the humble card. False humility makes us think that there is nothing that we can do or share to help other people. Our deception may not be intentional – we may not have set out to fool the other person into thinking that we are useless. “False” in this case may better be described as misdirected. A lack of confidence may be the underlying cause. 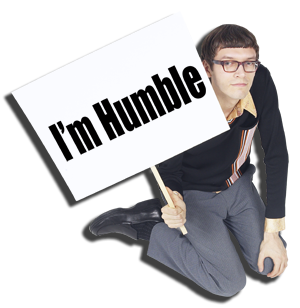 I see false humility as an expression of arrogance. When we withhold ourselves from someone that we may be able to help, we are basically saying that we, or our hang-ups, are way more important than they are. We can’t get over ourselves, whether it is insecurity or lack of confidence, long enough to see that we actually can make a different for someone else. This is self-centered and prideful. I don’t plan to run around acting like a sage who possesses all knowledge. But if a friend asks me for some advice or wisdom, and I have it, I hope I am humble enough to help. Yesterday, I engaged in a long conversation with a friend and colleague. We didn’t discuss anything new. In fact, this was a conversation that we’ve had many times in the past. Since we are team members, we talked about some of the challenges we are facing in our work and kicked around a dozen or so ideas that may prove to be solutions. The thing is, there were no new ideas…but we kept the dialogue going. He will tell you, along with anyone who knows me well; I get tired of the same old discussions. I don’t like repeating myself and I am not especially fond of others doing so. It usually feels so counter-productive. But sometimes there is no other way to work your way through an issue. After a couple of hours, I think we had a break though. No new revelations, just some determination to attempt some things. And that’s the value of conversation. You learn, grow, explore. Don’t get bored with the same script. There may be something new that God is saying to you. Maybe it’s not new, but maybe you haven’t yet heard the old clear enough.